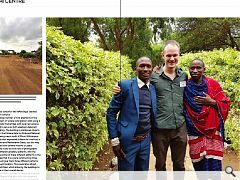 Fresh from a visit to Kenya to prepare the ground for a new cultural centre Jonathan Reeve of the Voigt Partnership explains how an Irish architect working in Arbroath came to be involved with a school and cultural building for the Maasai Tribe in Amboseli, Africa. In 2017 two American charities (My Chosen Vessel (MVC) and Amor Ministries) partnered with a vision of creating a new building in Kenya which had been desperately needed by the Maasai people. Founded in 2009 MCV is a registered charity in the USA & Kenya, with a mission to empower Maasai people through water, education and culture conservation initiatives. Amor is a San Diego based charity that has been facilitating trips around the world for over 30 years in Mexico and South Africa to build houses in poor communities. They use teams of volunteers and their construction expertise to produce very quick on-site builds. I first encountered Amor Ministries whilst volunteering on a house building project in South Africa in 2015 and was invited by Amor & MCV in 2017 to use my architectural and creative input in a Kenya school project. 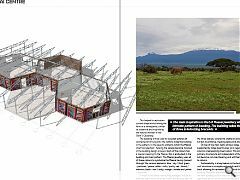 In August 2017 a team was assembled to design a new school and cultural centre for the Maasai. 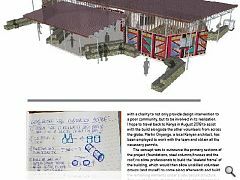 The project is to construct a multi-use facility consisting of three key elements: a primary school – enough to accommodate 60 students in one room; a cultural centre - similar in size and shape to the school to display and store artefacts and an office capable of accommodating 20 people in a conference setting. 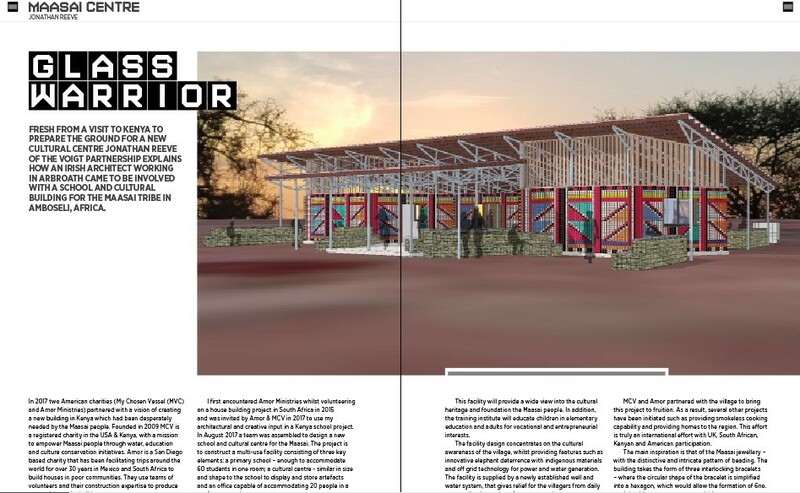 This facility will provide a wide view into the cultural heritage and foundation the Maasai people. In addition, the training institute will educate children in elementary education and adults for vocational and entrepreneurial interests. 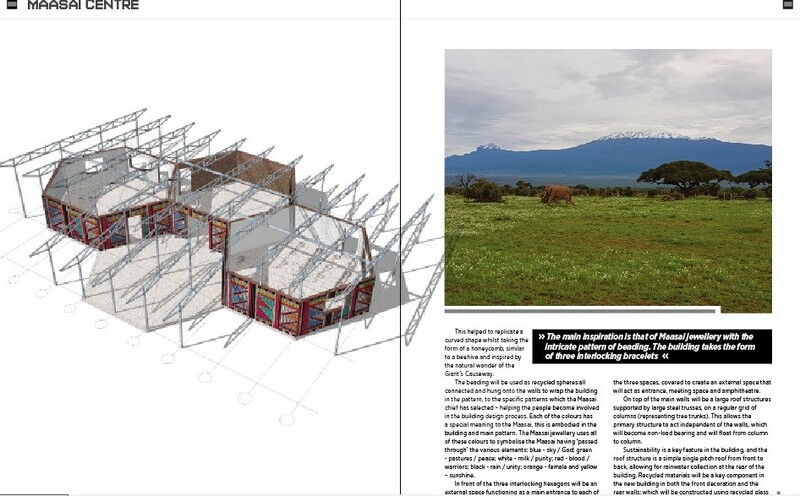 The facility design concentrates on the cultural awareness of the village, whilst providing features such as innovative elephant deterrence with indigenous materials and off grid technology for power and water generation. The facility is supplied by a newly established well and water system, that gives relief for the villagers from daily water collection and a safer water supply. MCV and Amor partnered with the village to bring this project to fruition. As a result, several other projects have been initiated such as providing smokeless cooking capability and providing homes to the region. This effort is truly an international effort with UK, South African, Kenyan and American participation. The main inspiration is that of the Maasai jewellery – with the distinctive and intricate pattern of beading. The building takes the form of three interlocking bracelets – where the circular shape of the bracelet is simplified into a hexagon, which would allow the formation of 6no. straight sides to create a space within. This helped to replicate a curved shape whilst taking the form of a honeycomb, similar to a beehive and inspired by the natural wonder of the Giant’s Causeway. 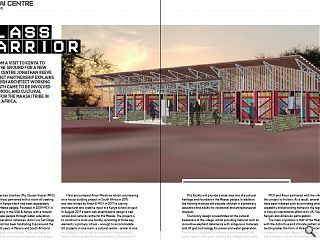 The beading will be used as recycled spheres all connected and hung onto the walls to wrap the building in the pattern, to the specific patterns which the Maasai chief has selected – helping the people become involved in the building design process. 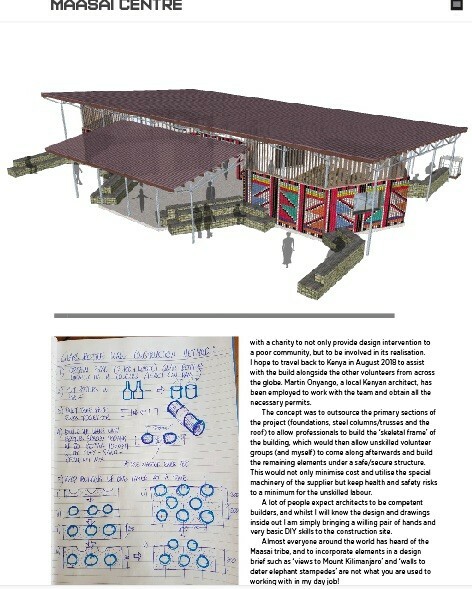 Each of the colours has a special meaning to the Maasai, this is embodied in the building and main pattern. The Maasai jewellery uses all of these colours to symbolise the Maasai having ‘passed through’ the various elements: blue - sky / God; green - pastures / peace; white - milk / purity; red - blood / warriors; black - rain / unity; orange - female and yellow – sunshine. In front of the three interlocking hexagons will be an external space functioning as a main entrance to each of the three spaces, covered to create an external space that will act as entrance, meeting space and amphitheatre. On top of the main walls will be a large roof structures supported by large steel trusses, on a regular grid of columns (representing tree trunks). This allows the primary structure to act independent of the walls, which will become non-load bearing and will float from column to column. Sustainability is a key feature in the building, and the roof structure is a simple single pitch roof from front to back, allowing for rainwater collection at the rear of the building. Recycled materials will be a key component in the new building in both the front decoration and the rear walls; which will be constructed using recycled glass bottles to create a colourful wall reflecting a ‘stained glass window’ of a church. There are a large number of wild elephants in the region and a system of simple solid gabion walls using a wire framed skeletal frame filled with local red volcanic rock will be used to serve as both elephant deterrent and outdoor seating. The building is positioned close to a main road near the Kimana Gate to Amboseli National Park, whilst allowing views south of Mount Kilimanjaro. The governor has also expressed a desire to construct a building at Iremito and Meshananai Gates, but this may have to be phased over several months or years. During the site visits we took lots of photographs of some of the different jewellery patterns, with the potential of using some of these different patterns in the building – the idea that if we were constructing three buildings we would give them three different patterns appropriate to each location. This would also attract people to ‘visit all three’ whilst allowing the buildings to all read the same in their overall design. 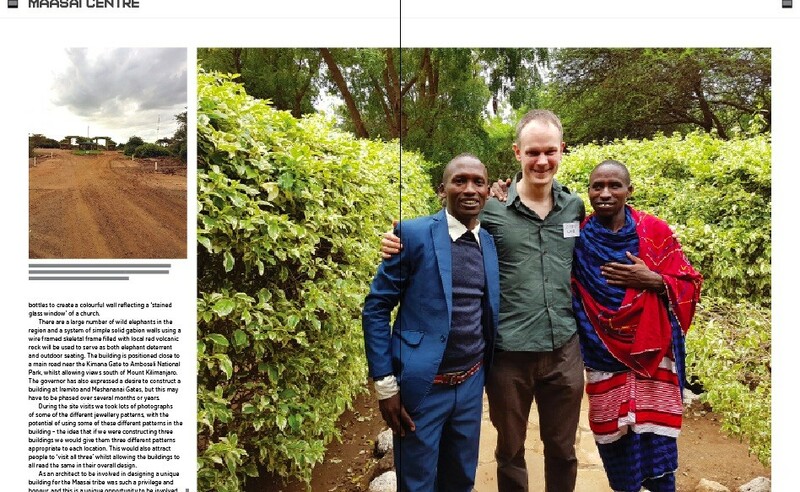 As an architect to be involved in designing a unique building for the Maasai tribe was such a privilege and honour, and this is a unique opportunity to be involved with a charity to not only provide design intervention to a poor community, but to be involved in its realisation. I hope to travel back to Kenya in August 2018 to assist with the build alongside the other volunteers from across the globe. Martin Onyango, a local Kenyan architect, has been employed to work with the team and obtain all the necessary permits. The concept was to outsource the primary sections of the project (foundations, steel columns/trusses and the roof) to allow professionals to build the ‘skeletal frame’ of the building, which would then allow unskilled volunteer groups (and myself) to come along afterwards and build the remaining elements under a safe/secure structure. This would not only minimise cost and utilise the special machinery of the supplier but keep health and safety risks to a minimum for the unskilled labour. A lot of people expect architects to be competent builders, and whilst I will know the design and drawings inside out I am simply bringing a willing pair of hands and very basic DIY skills to the construction site. Almost everyone around the world has heard of the Maasai tribe, and to incorporate elements in a design brief such as ‘views to Mount Kilimanjaro’ and ‘walls to deter elephant stampedes’ are not what you are used to working with in my day job!